At the beach where I go to walk among the gulls and mutter about darlings that won’t take a hint, where I write sometimes in my car or at a picnic table if the weather allows it, or simply breathe and gather pictures, I am rarely alone. There are the gulls of course. And yesterday a woman in a headscarf eating a MacDonald’s burger in her car as she read something I couldn’t see. Maybe because the day was sunny, or maybe because of the recent holidays and all that family and turkey and Auntie So-and-So’s Marshmallow’d sweet potatoes that render even the strongest among us a little queasy but is a tradition so must be taken with a mmmmm, that sure is good, Auntie So-and-So as you try to disguise the stuff under a pyramid of wing bones—maybe because of that, there is also a man in his car next to mine, eating a whole pizza from the box on the passenger seat. 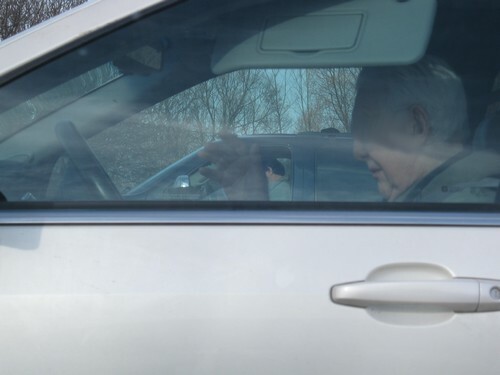 Another man, this one elderly, stares out the window of his medium sized silver sedan, one hand held in the air over his head. I consider dementia, an open-eyed cat nap with sleep paralysis, loneliness turned eccentric, but then, as he remains focused on the lake, his fingers begin to move ever so slightly, more and more until with a dramatic swoosh his whole hand is swaying back and forth, then stops—and his fingers again…fluttering, graceful. I realize he’s listening to music and I wonder if it’s on radio or CD or just in his head. I turn the ignition, flip the dial until I land on CBC 2. A symphony. I glance back at the man who is still conducting, eyes open, now closed—his movements, the pauses, the dips, the quick tilt of his hand as the violins come in, match what’s being played. It’s a long piece and gives me time to consider why he’s there. I decide it’s a solemn day, an anniversary—of what though, his wife’s birthday, their wedding, her death, the death of their first child perhaps (was that child a disappointment or a joy? ); is this the date he was taken prisoner of war sixty something years ago or is it a year to the day that his wife announced she was leaving him for the guy that runs the Saturday night films at the Senior Centre? Who knows, maybe he’s celebrating. Later, a couple arrive in a small red truck. The man is driving. The woman’s head is down, facing her lap. When he turns off the ignition she looks up but her eyes are vacant, she could be anywhere. She stays in the truck while he gets out, lights a cigarette and walks toward a few gulls perched on a railing. He stands facing the water and I’m pretty sure I see his shoulders drop at least a few inches as he exhales. You are a great observer. You remind me that stories are everywhere we are, and with a little thoughtful observation, we can open ourselves to them. The dear man listening to the concert … I care about him already. Me too. He was lovely.